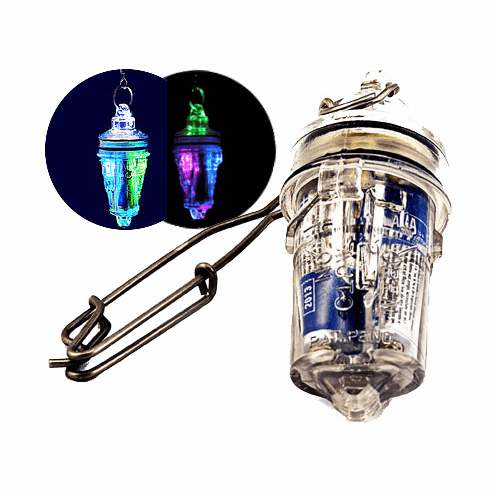 Electralume® Under Water Multi 3-Color Fishing Lights Miami Fishing Supply, complete selection of offshore fishing tackle, marine electronics and boat supplies. The Electralume has emerged as the next generation of fishing lights. LED lumination means the Electralume doesn't fade overnight like chemical lights. With a battery life up to 500 hours, the Electralume offers a consistant high intensity illumination that outperforms chemical light sticks. The Electralume lasts longer and penetrates deeper into the water to catch more fish. Electralumes are proven effective for swordfish, grouper, snapper, halibut, and other species that are attracted to light. The Electralume comes in a variety of colors including Green, Blue, Aqua, Purple, Red, and White. LP also offers multi colored Electralumes and a full spectrum version that flashes every color in the fish attracting spectrum. Electralumes have become the weapon of choice for swordfisherman throughout the world. You can't find a boat that catches swordfish without an electralume powering up their spread. While there are many different options on which color works best, you can't go wrong trying 'em all.